Chassis number: 0306 was built for the 2002 F1 Season by Jaguar Racing and was driven by Eddie Irvine during the season. Irvine scored a best result of 3rd at the Italian GP in 2002 and finished 9th in the Drivers Championship that year – both high points for the Jaguar team. Fitted with a fresh Cosworth V10 CK which is the correct engine for this car, both 7 speed semi -auto Gearbox and chassis are also freshly prepared. This car is one of only a handful of late F1 cars that are possible to run without factory assistance. 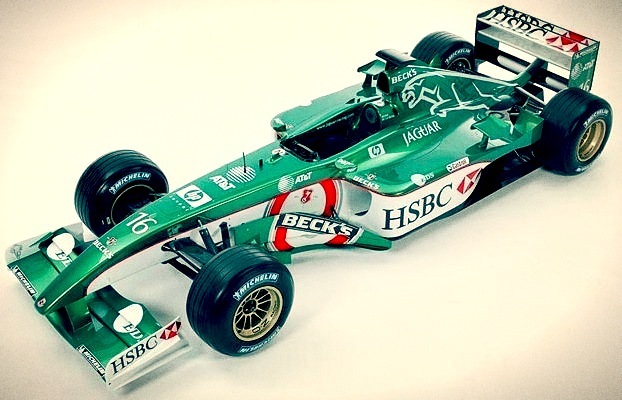 The Jaguar R3 is a Formula One racing car with which Jaguar Racing competed in the 2002 Formula One season. The car was launched on January 4, 2002. It was driven by Eddie Irvine and Pedro de la Rosa, both retained from 2001. After the disappointing past two seasons, 2002 was even worse for Jaguar. The team admitted to making a lot of mistakes especially in the wind tunnel, as its calculations were wrong. After an impressive fourth place at the attritional Australian GP, the car’s poor reliability and lack of horsepower began to show and the team slipped down the rankings; however, towards the end of the season updates were brought in and the car began to improve, culminating in Irvine scoring the team’s final podium finish at Monza. The team finished 7th in the Constructors’ Championship, with eight points.